Now under new ownership/management, Estrella del Mar’s oceanfront location creates stunning ocean golf holes and wide ocean vistas. You’ll want to vacation here, and perhaps own your own slice of paradise. Send me more information about Estrella del Mar! Six holes play right alongside the ocean. The 18-hole Robert Trent Jones Jr. layout was built in 1996 and is one of only three designed by him in all of Mexico. 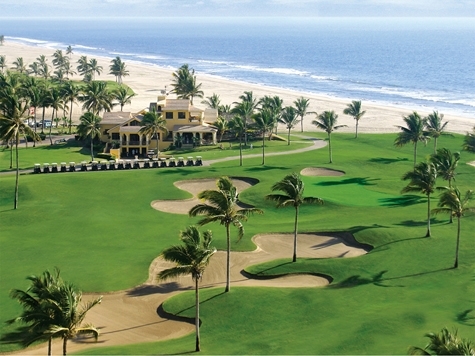 The course parallels the over 3.5 miles of beachfront with six holes playing along the ocean. Rolling, green palm-fringed fairways combine with elegantly designed bunkers to make your golf experience stunning in beauty and challenging in play. Send me more information about Estrella del Mar! Estrella del Mar is environmentally conscious and features a turtle sanctuary dedicated to protecting sea turtles and other precious life at the resort. You can tour the facility at no charge and see the turtle pool and iguana pen. You’ll learn firsthand what Estrella del Mar is doing to preserve its local environment. Send me more information about Estrella del Mar! 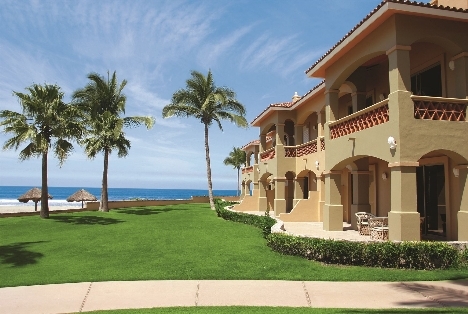 Estrella del Mar’s beachfront and golf condominiums offer exceptionally comfortable living with spectacular ocean views, and easy beach and golf course access as well. Each unit has been designed to maximize views of the ocean and has either a private walk out patio with immediate access to the swimming pool and beach or a private deck providing panoramic views of the waterfront and amazing sunsets. For details and pricing, see the real estate section below. Send me more information about Estrella del Mar! Send me more information about Estrella del Mar! Estrella del Mar is a different kind of Mazatlan development, according to the community’s development team. You won’t find crowded beaches, Spring Break parties, an abundance of vendors or loud music. Instead you will be greeted by miles of empty white sandy beaches, lush tropical landscaping, fine dining, sophisticated architecture and unsurpassed privacy. Stay at the onsite Hotel Las Villas-Single or Double Occupancy. *Blackout Period Apply. Not applicable with any other promotion or discount. Must be a direct booking and be pre-registered with the Real Estate Department at Estrella del Mar. Not available for groups. *Blackout Period Apply. Not applicable with any other promotion or discount. Must be direct booking to Estrella del Mar Resort.